I am the pioneer of my family originally from sunny southern California. I was very determined to go as far in my career as I could, but I never imagined I would work for NASA. I always wanted to become an artist. There were many obstacles I knew I would have to overcome in order to become a successful artist. I was very determined to go beyond the limits to what was offered to me as a young girl and not become just another statistic. My mother and father were very young parents when I was born. As a result, they were both unable to graduate high school or go to college. I knew I was going to be the first in my family to graduate and I was not going to let anything stop me or get in my way. After graduating, I immediately went off to college and finished with an Associate Degree. I was not successful in obtaining good job prospects in my field where I lived and I wanted a change of atmosphere. Despite my father’s recommendations, I joined the military. The United States Navy offered the opportunity to learn discipline, be courageous, and be proud to be a part of something big. The camaraderie between veterans is like no other organization. There is an automatic understanding and honor given to all my veteran comrades about all of the hardships we had to endure for the greater good. I am truly honored to be the first female in my family to serve several years in the military and hopefully pave the way for others in my family to follow. The education I obtained in the Navy was the key to my success. The Navy allowed me to travel to different countries and gave me different perspectives of cultures and the world. I spent many years obtaining all the experience and knowledge I can manage and used it to get to where I am today. I learned that our world had much to offer me but I did not want to stop there. I devoted my time to technology and art. Art had made its turn into three dimensional animation and I was ready to learn all I could about it. I wanted to create things “out of this world” and I was fortunate to come across an opening at NASA in the communications field. I applied for the job but never thought I would make the cut from the highly competitive applicants who also applied. I was extremely nervous interviewing in front of a board and showcasing my portfolio. I was very surprised and ecstatic when I learned that I was accepted into the position and would soon move to Mississippi. I have never been on a NASA Center before and I felt like I was in a movie going to learn all about the mysteries of our universe. The NASA Shared Services Center (NSSC) offered me the chance to build and grow my talents within NASA. I have used my skills to succeed in many ways and now have an extensive portfolio like I have never had before. I have been with the NSSC for four years and I am very fortunate to also have the comradery within my organization. The hardworking individuals I have had the pleasure of working with all these years keeps me motivated and dedicated to working with NASA for as long as I can. NASA truly is one of the best places to work. Ms. Venetia Gonzales has been working in the NSSC Support Operations Directorate as a member of the Strategic Integration and Communications Office. Ms. Gonzales is responsible for developing communication plans and strategies to support effective change management and evaluating existing strategies and plans for disseminating information regarding changes in services or impacts on NASA customers and stakeholders. She determines the most expeditious and appropriate avenues for dissemination. In addition, she develops and utilizes various advanced communication principles, methods, practices and techniques to convey information about the NSSC mission and programs to a variety of audiences, both internal and external. Ms. Gonzales served as a U.S. Navy First Class Petty Officer veteran and has served as a Civil Servant since 2003. Prior to her arrival at the NSSC, she served as a Visual Information Specialist, Public Affairs Specialist, and an Illustrator for the Department of the Defense (DoD). Her outstanding visual communication skills provide her the ability to graphically design, create, edit, and release a myriad internal and public information including newsletters, posters, reference guides, promotional materials, document templates and briefing materials in support of NSSC business activities. Her recent accomplishments involve research and development of improved marketing and communication products and proceedures. Venetia has brought innovative solutions to enhance presentations, face-to-face and and Web-based, including Prezi, a tool Venetia discovered and recommended, is now used as the part for the Agency brief: “The NSSC Story” (an organic collection of key messages, talking points, data, and graphics that shares the NSSC’s chronological narrative and illustrates the value and worth inherent in NASA’s embrace of the shared services model). These efforts resulted in her nomination for the NSSC Employee of the Quarter.Ms. Gonzales extensive interest in promoting Diversity and Inclusion and Equal Opportunity within the NSSC and NASA provided her an opportunity to collaborate with the NSSC Diversity and EO Office and the Stennis Space Center (SSC) site-wide Diversity Council in planning a wide variety of programs and activities to further equal opportunity and diversity and inclusion initiatives. 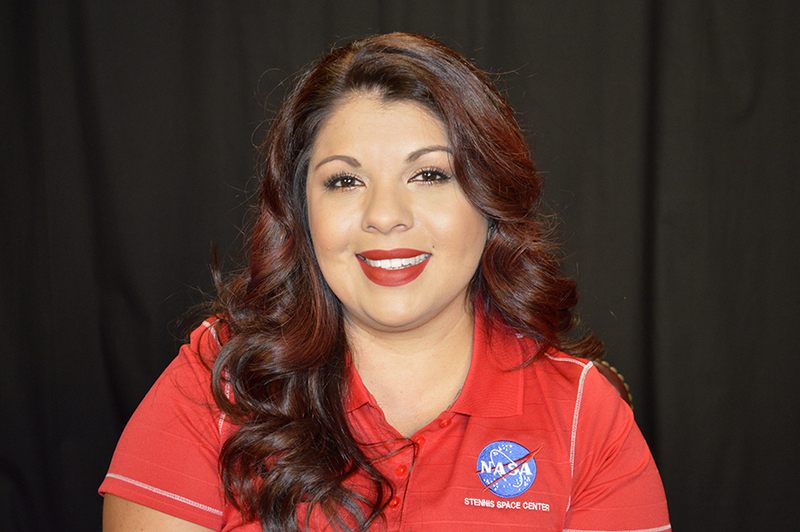 Ms. Gonzales has supported several NASA outreach opportunities and work in association with SSC affiliates such as: Essence Fest Hispanic Engineer National Achievement Awards Corporation (HENACC), and Diversity Works. The education and outreach activities focus on helping area residents learn about NASA and Stennis’s role in the future of space exploration as well as promote the Science, Technology, Engineering and Mathematics (STEM) programs. She planned and delivered the SSC site-wide the 25th Annual Observance of the Holocaust Days of Remembrance program and designing and producing a professional quality video retrospective from previous Holocaust guest speakers. Ms. Gonzales has received three Navy Achievement Medals during her active duty military career and several NASA Certificates of Appreciation. She also received a Letter of Appreciation from Rear Adm. Timothy C. Gallaudet, Commander, Naval Meteorologu and Oceanography Command, for her dedication and superior contributions to the Holocaust program. She is a native of Los Angeles, California where she earned her Associate Degree and currently attends Tulane University, in Biloxi, Ms.